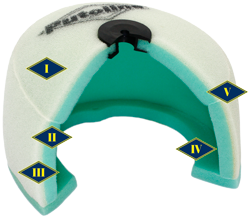 Fused outer and inner elements prevent dirt and grime from being lodged between layers, unlike Twin Air, this can be a problem with inferior two-piece designs. Trapped particles can restrict airflow. And if dirt works it's way into your engine, a pinhead-sized granule will gouge your used-pre-oiled-air-filter-smallcylinder, piston and rings like a bullet. 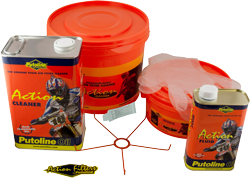 For information about Putoline Air filter oil, cleaner and maintenance products please visit the official Putoline Oil Lubricant website. 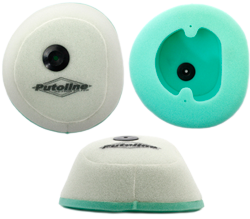 You can visit the website by clicking on the Putoline logo at the top of this page.